In nearly every organization, safety leaders are familiar with the concept of unintended consequences. Unintended consequences (or externalities) in firms are the result of a new policy or procedure which produces results that range from nearly intended to perhaps the opposite of what was initially intended. In sociotechnical systems, this is never the case. By ensuring that safety leaders focus on incident rates, and not risk, the compliance industry has created a set of unintended consequences for safety that are easily recognizable in many organizations. When this happens, it translates into activities such as the squelching of reporting, the punishment of individuals, and aggressive management of occupational injuries and illnesses. Campbell wasn’t specifically looking at recordable incident rates at the time; he was more attentive to issues that foment social change. However, his rule is relevant to safety leaders. As incident rates are communicated, made visible through government reporting, compared by procurement management (e.g. ISNetworld™, Avetta™), and used as a basis to select or reject the ability of an organization to perform work for owner/operators (the social decision-making Campbell referred to), I think that safety leaders would agree that it has been subjected to gaming through unreported injuries, organizational pressure not to report and tortured by occupational health providers. The term “rat effect” is a cultural artifact left from the time when the French had colonized India. As part of a strategy to rid a particular area of rats, the government instituted a policy in which citizens were paid to kill the rats. In order to be paid for killing the rat, one only needed to present the tail of the animal to qualify for payment. What ended up happening, was that the persons who were supposed to do the rat killing, only chopped the tails off the rats, and released them back into the sewers… to breed more rats. By breeding more rats, the rat killers had more opportunity to profit. Industry has done its part to try to create incentives for keeping workers from injury and ill health. Ask an operations executive if you can go to work with an elevated injury/illness incident rate. Predictably, contractors respond with increasing innovative ways to keep incidents rates down, but in most cases do very little to improve the exposure of hazards and risks to their employees. OSHA’s solution to the problem of injuries and ill health has been focusing on the symptoms of the problem, and not necessarily the cause. Continued regulatory targeting of organizations with high incident rates only serves to increase the visibility of these symptoms, but does nothing to address the root cause. Criminalizing the appearance of symptoms furthers the incentive to keep from reporting them. Use an oblique goal. Is there another way that we can get the same result, but measure it in a way that the result becomes externality? An oblique goal or objective is able to achieve the desired effect as an externality. For example, if an organization wants to reduce injuries and illnesses, why not reduce the hazards and risks that personnel are exposed to? This way risks get addressed and treated, and as an emergent result, injuries and illnesses will get reduced as well. Proactive Systems. 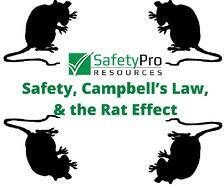 Preventing unintended results and rats takes proactive leadership. This means that organizations can no longer react to safety issues and problems. They must go out and seek them. This can’t be done through compliance checklists, more safety observers, and reactive controls. Companies must take a long-term view of safety, risk, and strategically plan in the same manner as they do in other business units or functions.